The adoption of precision farming techniques (PFTs) has been widely studied targeting specific PFT or farming systems along with the potential benefits of these PFTs in terms of yield or input use. However, few studies have examined how PFTs are adopted and used at the farm level. In this study a preliminary investigation was made of on-farm PFT uses in the Oise region (northern France). Three main PFTs were identified in the area: Global Navigation Satellite Systems (GNSS) guidance, section control, and variable rate (VR) application. For each farm, the use of every PFT was defined by the technical characteristics of the equipment, the field operation(s) concerned, the targeted crop(s), the aim of the use, the PFT adoption drivers, and the perceived impacts by the farmers. These different variables were combined into a typology of PFT uses. The results show that most of the farms combined GNSS guidance for all technical operations and section control, whereas VR application was less common. Section control was largely used by farmers for liquid fertilizers and phytochemical spraying. The typology shows three to five types of use for each PFT, which differ in terms of technique adoption drivers, e.g. reducing on-farm work or adaptation to field morphology. According to literature, economic impacts were found to be the most frequent, however farmers seemed unable to quantify them. Social impacts such as reduced work time and fatigue were also frequent and are becoming the main motivation for using PFT on farms studied. Further research is needed to assess the use trajectories of PFT along with the motivations of each PFT use. We warmly acknowledge the group of students in agricultural engineering “Agronomie et Territoire” at UniLaSalle for their hard work in the initial phases of the research: Hélène Callewaert, Jean Manuel Clabaut, Juliette Descotes, Lucie Deterpigny, Marie Thérèse Gässler, Estelle Harant, Pierre Lauwerier, François Mathellié, Axel Moilleron, Damien Prévost (†) and Hélène Vanbesalaere, as well as useful discussions with Sophie Wieruszeski and Florian Vigneron from the Oise agricultural Chamber. 23 farmers answered our questions, and many thanks to all of them. We acknowledge the editor for helpful and constructive comments. This research did not receive any specific grant from funding agencies in the public, commercial, or not-for-profit sectors. Agreste. (2016). L’équipement dans les exploitations agricoles. http://agreste.agriculture.gouv.fr/IMG/pdf/primeur334.pdf. Accessed 14 September 2018. Agreste. (2017). Panorama du monde agricole, forestier, alimentaire—Série Hauts de France. http://draaf.hauts-de-france.agriculture.gouv.fr/IMG/pdf/2-exploitations-agricoles_cle08b514.pdf. Accessed 14 September 2018. Agreste—Hauts de France. (2017). Memento de la statistique agricole. http://draaf.hauts-de-france.agriculture.gouv.fr/IMG/pdf/memento-2017_cle02595f.pdf. Accessed 14 September 2018. Awad, S. (2016). A review of the past, present and future of precision agriculture in the UK (Research Report No. 87). UK: AHDB Cereals & Oilseeds. https://cereals.ahdb.org.uk/media/1126475/rr87.pdf. Cockburn, A. (1997). Structuring use cases with goals. http://pdfs.semanticscholar.org/674c/ce7cfcacefaa26c67cd9735828439da0c900.pdf. Accessed 7 February 2017. CRAAP. (2010). Présentation des systèmes d’exploitation agricole de Picardie. Chambre Régionale d’Agriculture de Picardie. http://www.hautsdefrance.chambres-agriculture.fr/fileadmin/user_upload/Hauts-de-France/029_Inst-Hauts-de-France/Exploitation-agricole/Rubrique_%C3%A9conomique/presentation_systemes_EA_dePicardie.pdf. Accessed 12 May 2017. DEFRA. (2013). Farm practices survey October 2012—current farming issues. England: Department for Environment Food and Rural Affairs. https://www.gov.uk/government/statistics/farm-practices-survey-october-2012-current-farming-issues. EPRS. (2016). Precision agriculture and the future of farming in Europe. Scientific Foresight Study. Brussels, European Parliament Research Service. http://www.europarl.europa.eu/RegData/etudes/STUD/2016/581892/EPRS_STU(2016)581892_EN.pdf. European Parliament. Directive 2000/60/EC of the European Parliament and of the Council of 23 October 2000 establishing a framework for Community action in the field of water policy., OJ L 327 (2000). http://data.europa.eu/eli/dir/2000/60/oj/eng. Accessed 4 December 2018. EUROSTAT. (2010). RAMON—Reference And Management Of Nomenclatures. NUTS (Nomenclature of Territorial Units for Statistics), by regional level, version 2010 (NUTS 2010). http://ec.europa.eu/eurostat/ramon/nomenclatures/index.cfm?TargetUrl=LST_CLS_DLD&StrNom=NUTS_33&StrLanguageCode=EN. Gavaland, A., & Goutiers, V. (2013). L’agriculture de précision : applications et perspectives en grandes cultures et prairies. http://prodinra.inra.fr/record/211868. Accessed 7 February 2017. Invivo. (2016). Focus sur l’agriculture de précision. https://www.invivo-group.com/fr/focus-sur-lagriculture-de-precision. Accessed 7 February 2017. Llewellyn, R., & Ouzman, J. (2014). 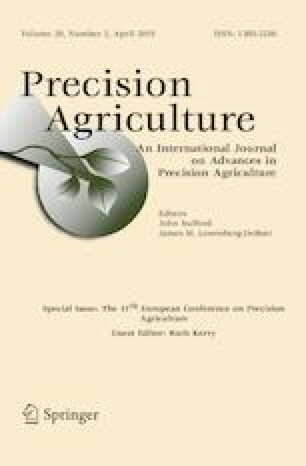 Adoption of Precision Agriculture-related Practices: Status, Opportunities and the Role of Farm Advisors. Montpellier, France: CSIRO. https://grdc.com.au/resources-and-publications/all-publications/publications/2014/12/adoption-of-precision-agriculture-related-practices. Accessed 12 September 2018. Melchiori, R. J. M., Albarenque, S. M., & Kemerer, A. C. (2013). Uso, adopción y limitaciones de la agricultura de precisión en Argentina. Presented at the Curso Int. Agricultura de Precision, Manfredi, Córdoba, Argentina. https://inta.gob.ar/sites/default/files/script-tmp-inta_uso_adopcin_y_limitaciones_de_la_agricultura_de_.pdf. Molin, J. (2016). Precision agriculture in Latin America. Presented at the INFO AG Conference, St. Louis, MO, USA. https://www.infoag.org/presentations/2378.pdf. Accessed 13 September 2018. Pierpaoli, E., Carli, G., Pignatti, E., & Canavari, M. (2013). Drivers of Precision Agriculture Technologies Adoption: A Literature Review. 6th International Conference on Information and Communication Technologies in Agriculture, Food and Environment (HAICTA 2013), 8, 61–69. https://doi.org/10.1016/j.protcy.2013.11.010. Zarco-Tejada, P. J., Hubbard, N., & Loudjani, P. (2014). Precision agriculture: An opportunity for EU farmers—potential support with the CAP 2014-2020. Joint Research Centre (JRC) of the European Commission. https://doi.org/10.2861/58758.